EXTREMELY RARE - VERY CLEAN. 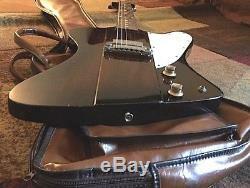 VINTAGE GRECO REVERSE FIREBIRD I PROJECT SERIES BLACK INKED SERIAL# 0 8700. 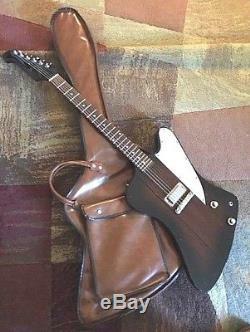 100% ORIGINAL AND COMPLETE WITH ORIGINAL FIREBIRD SHAPED BROWN GIGBAG. 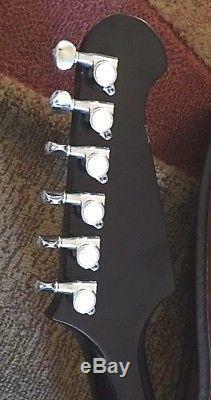 ALSO NON BANJO HEADSTOCK DESIGN WITH FACTORY 6 IN LINE STOCK TUNERS FOR BETTER BALANCE AND PLAY ABILITY. 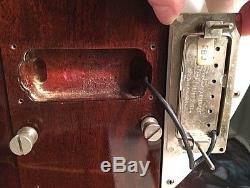 THE TUNERS ARE ALSO MARKED "MADE IN JAPAN". GORGEOUS IDENTICAL 60`s BROWN BURST WITH NICE WOOD GRAIN EXPOSED. 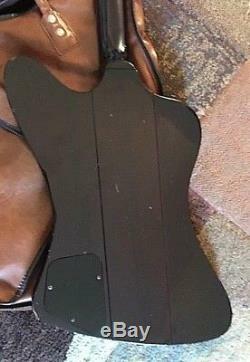 ALL MAHOGANY BODY AND NECK. VERY ATTRACTIVE WITH AWESOME VINTAGE VIBE - LOOKS LIKE THE REAL DEAL. 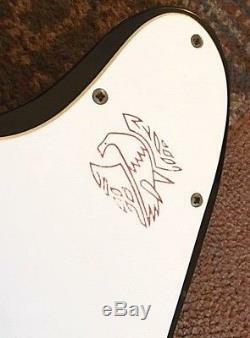 THE FIREBIRD RED BIRD IS STAMPED ON THE PICKGUARD AND ALSO IN GREAT CONDITION. 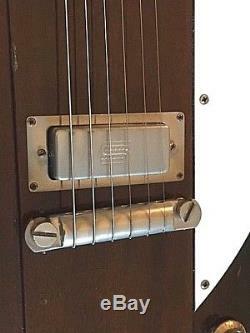 THE GUITAR PLAYS GREAT WITH VERY LOW ACTION, SOUNDS AMAZING WITH GREAT POWER, CLARITY, BITE, ATTACK WITH PURE VINTAGE TONE. 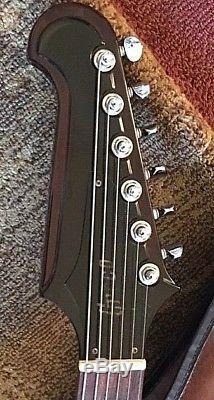 NECK IS VERY STRAIGHT, FACTORY TRUSS ROD, THE ORIGINAL NUT/STRING HEIGHT IS ALSO JUST RIGHT AND FEELS GREAT. INCREDIBLE PLAYING, SOUNDING AND LOOKING GUITAR. 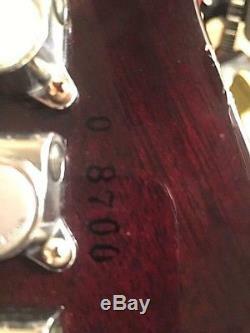 CONDITION (GUITAR): THE GUITAR DOES HAVE DENTS, WEAR, SCRAPES, SCRATCHES, PAINT CHIPS , ETC BUT NO REPAIRS, NO CRACKS, NO DAMAGE. KILLER VINTAGE VIBE TO THIS INSTRUMENT (LOOKS OLD). THE GOLD "GRECO" LOGO ON THE BLACK PLASTIC TRUSS ROD COVER IS SOME WHAT FADED, AND THE "TONE" ON THE TOP OF THE KNOBS IS COMPLETELY FADED, BUT ADDS REAL CHARACTER & MOJO. 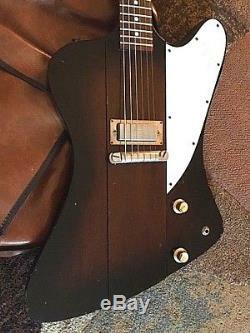 CONDITION (CASE): ORIGINAL FIREBIRD SHAPED BROWN GIGBAG WITH RARE BLACK INTERIOR. 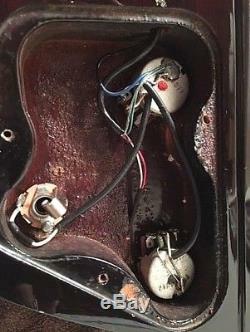 ALL ORIGINAL IN GREAT WORKING ORDER. ATTENTION: I HAVE EXPLAINED THIS ITEM TO THE BEST OF MY KNOWLEDGE. DUE TO BEING A USED OR A VINTAGE ITEM - NOTHING IS PERFECT NOR MINT. THANK YOU VERY MUCH FOR YOUR INTEREST & VIEWING MY LISTING. The item "SUPER RARE VINTAGE PROJECT SERIES GRECO FIREBIRD I 100% WithOSC LAWSUIT JAPAN MIJ" is in sale since Wednesday, November 7, 2018. This item is in the category "Musical Instruments & Gear\Guitars & Basses\Electric Guitars". The seller is "bluegiantgorilla" and is located in North Hollywood, California.